You often hear how Amish are highly law-abiding–that is, except when it’s come to the “important issues” of conscience, like military participation, schooling, etc. I’m not so sure though. Warning: I’m going to generalize a bit in this post. That said, I also detect a fairly defiant approach to government on the part of some Amish. This can go beyond simple grumbling about regulations and fees (which you hear from just about all Amish involved in any sort of business, Amish in the construction industry in particular). It can mean a surprising willingness to thwart the rules. Rudy Yoder first went to the Building Department to get a permit for a building to replace the bakery. Minard said the addition was considered a commercial building under state construction code, meaning Yoder must obtain sealed drawings by an architect or engineer. Minard said Yoder didn’t like that explanation and came back the next day, saying he was just going to put a storage addition on his house. Minard explained that if the building is used as a store, Yoder would need to obtain the proper permits or Minard would shut down the business. Minard said Yoder went ahead and built the addition, using it for his new store, and did not contact Minard to conduct a final inspection. Typically, Amish have taken their “big stands” against government on matters with religion at the core. Reading this story, nowhere can I detect any sort of religious conscience argument. I can’t find any compelling reason given outside of not wanting to comply with the extra cost and hassle. Yoder probably has a point when he says “I would really like to trade ends with one of those guys (with a government job) making $80,000 a year. I would love for one of them to be in my shoes. Get out here and see what we’re doing and see if you can do it any better.” But why do the rules not apply to him? This isn’t the only instance. In one Amish community I visited, I was able to track down an unmarked shop. The reason the shop was unmarked was in order to stay under the radar. Speaking with the shop owner, I learned fear of attracting local regulators’ attention was the main reason. Apparently, things had been going fine, until, coincidentally, just the day before. Inspectors had arrived. Changes would have to be made. One of the changes? Building a secret room to be able to store and sell cheese, the owner explained. Raw milk is another example. The Allgyer case became a national story and rallying point for raw milk activists earlier this year. I don’t see a clear religious conscience issue there, but maybe I’m missing something. Hey, I don’t like all the rules and regulations either. But rather than being bold and inspiring stands on the part of core religious and cultural beliefs, Amish thwarting the powers-that-be in these instances seem driven either by a desire to earn more money or resentment towards outside interference in personal freedoms. Don’t get me wrong. I think those are good things. The Amish in these examples may be inspiring for champions of economic liberties. But that isn’t what Amish existence is based upon, at its core. Or where they’ve made their big stands in the past. Those have typically been areas of religious belief. I certainly sympathize with complaints about regulation. I think we have too much of it. There is a subtle tyranny that can erode freedoms over time by a thousand nicks and cuts. Poland, for all its foibles, is less regulated (and less litigious) in many ways than the US. But it’s interesting that there seems to be a willingness to engage in basically dishonest behavior on the part of people who profess honesty as a cardinal virtue. Does the fact that the dishonesty is against the government make things different? All this said, I have a lot of Amish friends and acquaintances who would criticize this kind of behavior. You may not like the laws, but you gotta live with ’em. But there’s one other point to consider: on some level, these individual and economic liberties may not be that far apart from the religious and cultural ones important to Amish (and the rest of us). Once you start yielding to your rulers in one area of freedom, do you make it easier for them to take away other freedoms? 20 responses to Do Amish respect the law? I know I owned a store once and there is a lot of red tape you have to go through, but I complied with them. I can understand how the Amish, like many of us who are not Amish, would like to beat the red tape. Some of the rules on the signs, sizes, building inspectors, etc. are so dumb you wonder why they are made, but if you are in business you still have to go along with them. I always said it was the price to pay for owning your own business. I think the Amish should go along with the rules and regulations like we do. A Mennonite friend of mine bakes for Farmers Markets, road side sales, etc. and in New York State her kitchen has to be inspected, she also has to have licenses for her kitchen and another license with her where she is selling her baked goods. Everything has to be wrapped just so with all the ingredients on it. She can not give samples of the items out as they may be infected while exposed for people to eat. She has pages upon pages of New York State laws and regulations. Every year they changes these rules and regulations, but she has to go along with them to keep baking and selling. I think that’s life in business today no matter what your religious beliefs. I think the Amish, like us, are getting tired of so much governmental interference, in our day to day lives, and businesses. This is the land of freedom, but seems there is more and more regulations, every day, on us. Our only way to peacefully try to change things, is to contact our representatives to make them see OUR point of view, as a hard working citizen, that is just trying to make a decent living. I don’t think the Amish think they are “above the law”, but fear that their religious beliefs are being tampered with, in this ever changing world of politics and governmental controls. I feel their pain and respect their way of life. If only our ‘leaders’ could take the time to learn some things from the Amish. Sharon, I think what you’ve expressed is a growing sentiment among people and business owners in particular. Come to think of it, I guess this fits with the rationalization Rich describes below–I didn’t pick these leaders, so why should I have to bend to their rules? Thanks, Erik, for your important and nuanced thoughts on the Amish and the law. I suspect that proportionately there are no more scofflaws among them than among us. But most of us have high expectations that the quiet of the land will obey those laws of the land that do not conflict with their religious convictions. I have heard (unsubstantiated) that a significant minority of Amish sportsmen, for example, ignore for whatever reasons, certain game, trapping, and/of fishing/boating laws. Of course, this happens among mainstream sportsmen also. Through ignorance–sometimes willful—many Amish routinely use pirated songs in their compilation of music for schools, youth singings, or song books for plain people. However, I have attended dozens of evangelical church services where “off the wall” songs show no required copyright permissions at the bottom, or choirs sing from Xerox copies—“to save money for the work of the Lord.” At the Christian college where I teach, students routinely make unauthorized copies of music and DVDs, even though they have been informed about the legal and moral reasons why this is wrong. Well stated Rich, thank you, and for these other examples. That’s a good point on why it might be easier to rationalize. My meaning was not to take a holier than thou attitude–I have a lot of sympathy for these folks in this case, and hey, I’m far from perfect–but I think you struck at the heart of it. It’s not what we’d expect of the quiet in the land. And it being an Amish example, it’s only going to be louder than if it were a “regular” member of the public involved. Related to this is a point that came up during controversy this summer over Amish and e-filing taxes in NY state–that there is a certain amount of public sympathy for the collective Amish which may really come in handy sometime on consequential issues–as long as it isn’t squandered or damaged by a few in the meantime. I may be assigning too much weight to the actions of a few affecting the perception of many. Or maybe not. I’m not really sure. When people live immersed in their church, they are likely to decide that they simply are not going to abide by all the regulations and rules of outside society. If those regulations and rules make it difficult to earn a living or cost too much money to implement, it is very tempting to circumvent them. St. Paul did warn the early church to conform to local laws, as much as they could, as God had ordained a well-regulated society. (That’s my own paraphrase.) I have to say I am of the same mind about many laws and regulations. I would not open an unlicensed commercial kitchen or bakery, though, because the penalty of lacking that regulation could be unsafe food and illness for others. That is the main reason I do not bake for farmers’ markets or other venues. I would have a garage sale or sell at a flea market without a business license or local permit if such was required, because that violates both common law and common sense. I think that the two kingdoms theology of Anabaptism is sometimes used as an excuse, but it also informs daily decisions about commerce and trade. Amish have had many problems with local inspectors and regulations about home and business construction because they do not want to use licensed contractors nor meet local ordnances as to wiring, fire safety and other matters. Selling milk either to the public or to dairies has also been an issue in terms of requirements for sanitation or refrigeration. I agree that often these regulations are too expensive and even nonsensical. This will always be a matter in tension between cultures of faith and the government. 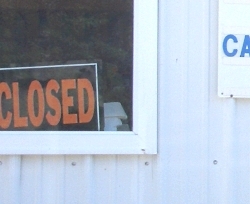 Regulation can be used to harass a particular group into disbanding or relocating, or to keep them from opening competing businesses with established locals. It can only be resolved fairly by discussion and arbitration. I am always sorry to see it go to court, because the court systems are often structured against those who are outside the mainstream. I guess I could write a long essay on this, but I won’t do that here – maybe I will give it some thought and research so I can post something on Anglican, Plain. As to using contractors, why use contractors when these people know what they’re doing and not needing a contractor who probably charged very high prices. These people know what they’re doing with hundreds of years of experience handed down and lived. If milk ever got tainted, they’d lose their business. Just think. You but milk from them. Probably because you like it and it’s natural. You’ll eventually talk to others that buy the same. If you got sick or ill, you’d talk to others, where no one else got sick which would suggest something else. But if others got ill, eventually he wouldn’t have a customer. Also, look into commercial processes. P.E.T.A. has pictures. Look at requirements. There’ll probably be a tolerable or acceptable amount of feces or even mucus in the milk. Where I’d suspect it goes through filtering and pasteuriztion, et cetra so that contaminants are killed even though present. Amish, I’d guess they know what’ll make an animal ill, so keep animals cleaner as well as containers and conditions. Here again, why are the Amish excluded from these ideas thrown around about them? Because they don’t use electricity or technologic communications. Lord, before long, you’ll have an old time lynch mob already set in your mind how things are and the people never got to hear accusations against, much less to provide a defense. Or representation to better express their position. Amish are also known for their skill in everything that do. I’d imagine there’s some pride in their craftmanship too. Where when done with something, they know it’s good. Having out their heart into it. If the zoning board and code officers around here kept records on the Catholics, Baptists and Methodists like they do on the Amish, they would find that the vast majority of violations are committed by non-Amish. Could be true, but I think we (fairly or unfairly) have higher standards for Amish. Which is why it gets your attention. Do the regulations that entrepreneurs and small businesses have to deal with protect the public/consumer? Or do they exist primarily because big business, big ag., etc., know that when small businesses have to comply with the same regulations as big companies, they are forced out of business due to the time and expense of jumping through all the hoops? “Everything I Want to do Is Illegal” by farmer Joel Salatin, is a great, informative and entertaining read. I’m smiling at Erik’s point that we have higher standards for the Amish. True for me, and I have at one time thought their life was perfectly submitted to God. But your column and some Christian books written by authors whose families have been Amish or Mennonite show that their life too has its weaknesses. I am not surprised when I remember as Christians we are still very human, living our life in obedience as best we can. We will not do that perfectly. I am wondering if the different rules the individual orders of Amish and Mennonites have make this avoidance of laws easier for them to view as rules of “another culture”, and therefore as not being necessary for them to obey. I think many of us can begin to see laws that we are under that have their point but can then become over regulation. It’s helpful for me to see the Amish more realistically, as Christians who are doing their best to live a Godly life and that their doing so is not always perfect either. The part of the story above that I find the most interesting is the one about the person who was in the position of regulating. There is a huge generalization about the Amish in our society — that they are so neat and clean that they regulate themselves. And for that reason, the people who are in the position to regulate often steer away from going after the Amish at all. Given the reputation of the Amish, many don’t want to be perceived as “pounding” on the Amish. Very often people would see them as bullies for doing such a thing. After I left the Amish, I ran an in-home bakery business. Using the high standards I grew up with, I never had a problem when the inspector came unexpectedly several times a year to look things over. Then one day he saw a rubber scraper I was using had a crack in it. He told me that was a health hazard. I threw it out then and there and replaced it. I bring this up because I simply did not know that. And my guess is that most Amish women wouldn’t either, being frugal and not wanting to throw away something that still functions. What else might they not know about? In the case of the building that wasn’t up to code, it would be interesting to know how much more it would have cost to implement the state standards. Some of the things the Amish get stubborn about are just not worth resisting, as I see it. The triangle issue in Kentucky is simply absurd. If any other religious sect in this country — say the Mormons or the Johovahs Witnesses — made issue of anything so small, what would be our level of sympathy? When I was died in the wool Amish I thought we were God’s special people and the law doesn’t apply to us. This is the long and the short of Amish thinking about the laws of the land. Katie, what a succinct way of putting it – you are absolutely right about that! I suppose I’ve been out of the Amish culture long enough to have forgotten some of the Amish ways of thinking. As someone who has always tried to obey the law, I’m not sure I’d agree with putting it like that… But opinions will vary. I would agree with Roberts’s point that non-Amish commit just as many, if not more, violations of various codes and laws that seem foolish and unneccesary. We just don’t hear about it when they do. It’s generally only news when an Amish person does it. I think there is a growing distaste for government regulations in general; no matter where you live. I’m not sure why either as we all know that ALL government rules and regulations are so logical and well thought out (insert winking smiley face here!). I’m not sure what the right answer is, because the whole concept of food and drug safety came about because of abuses in the early unregulated markets. That said, it often seems the process is used in today’s world to discourage competition or punish political enemies. There seems to be a disconnect between what is needed to protect the consuming public and what we have in place in the way of regulations. I’m pretty sure just ignoring the laws and regulations is not the answer, though frankly I am often personally sympathetic to that position. This is just my own opinion and not my son Mark’s. What peturbs me about all of these health rules and regulations that the government slaps on local food producers is what about all of the food coming into this country from oversees. Are U.S. health inspectors going to the Chinese orchards, Mexican ranches, and Thai shrimp farms to make sure everything is hunky-dory. I don’t think so. But, a small Amish bulk food shop tries to sell some cheese and they’ve got to have a separate septic tank because of greasy water coming off of the cheese knife at a cost of thousands of dollars. There’s reason in all things. I think this article shows that the Amish have difficult and stubborn people among them just like any group of humans. I was going to write I don’t think it’s right to ignore laws unless they go directly against scripture, but the song-book comment brought me to a stop. I’m embarrassed to admit I did not realize copying a song could be illegal! Oh my… how often have I copied the words to a song for a family gathering singing booklet or whatever and never once thought it was wrong. Hmmm. So now what??? I’m a lawbreaker and did not even know it! There is another side to this story, though. It is not unheard of for government officials to have a grudge. We know of one community where it was proven a state health inspector was giving the Amish a harder time than his non-Amish places and once it was proven he lost his job. I don’t think that happens often, but it’s not unheard of. But red-tape? That might be one thing we all agree on — it’s frustrating! In our situation with the Amish, they CHOSE to take our land as it was MORE convenient than the Ingress and Egress they got when they purchased their land. In my research the ‘old abandoned road’ was NEVER a road at all but a Range Line for the Holland Land Company in New York State. Our Town Board SIDED with them and their Attorney making it OK for them to USE our land by way of a Resolution and claims that the Town can Do Eminent Domain. No Money has been offered for our land, the Town does not maintain the ‘road’, and the liability still lies on us because it is OUR property, Even after the Amish cut down 441 trees and girdled two larger ones. I wonder if the TOWN got paid off to let them get their way. Letters from our STATE representative says they are LAW ABIDING people…yet they were FREE to TAKE (STEAL) something that was not theirs! Is that Godly? I would think that GOD is NOT happy with their actions as I AM A CHRISTIAN as well. How can one Religion think it is OK to take from a person of another Religion? These Amish don’t use Slow Moving Vehicle signs either and are a danger on the roads with their extremely small lights at night. I respect their way of life but the way they take advantage has to stop. Leave a reply to Do Amish respect the law?